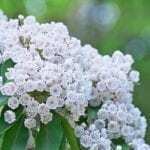 When do I harvest laurel and pieris seeds, and when do I plant these seeds? Generally, cuttings would be the easier way to go with these plants; however, for the laurel, harvest the seeds before they have fully harden, but wait until the pods start to brown and open one. If the seeds are reddish in color, they should be ready to plant right then. As for the pieris (lily-of-the-vally shrub, I am presuming), collect seeds right after their spring blooming and allow them to dry or plant them right away.